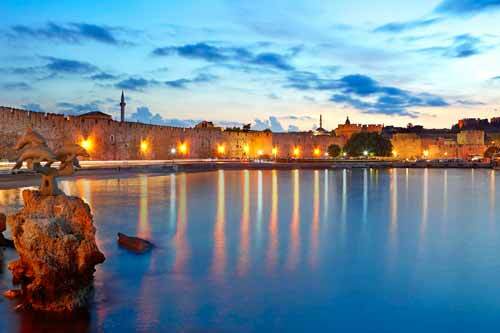 Rhodes boasts more fantastic beaches than you can count on two hands, but it’s a rich and diverse island. On this full day guided tour we will show you some of its highlights and inspire you with its history. Our chosen spots are; the Valley of the Butterflies, walk through the shaded, natural valley of oriental sweet gum tree’s and see the beautiful *Jersey tiger moths cover the tree trunks in colour as they rest before the next stage in their migration. Venture on to Ancient Kamiros, a sophisticated city in ruins and one of the three ancient cities of Rhodes. A refreshment stop in the village of Sianna, known for its excellent local produce of honey and ‘Souma’ (the local fire water)! Then onto the drama of Monolithos, a ruined castle perched on the pinnacle of a rock with a stunning backdrop of the sparkling Aegean Sea. Time for lunch in the village of Embona, the islands wine growing region. And as we wend our way back we will stop off at a local ceramic maker where you can see the Rhodian designs from throughout history. *Butterflies can only be seen between May and September.